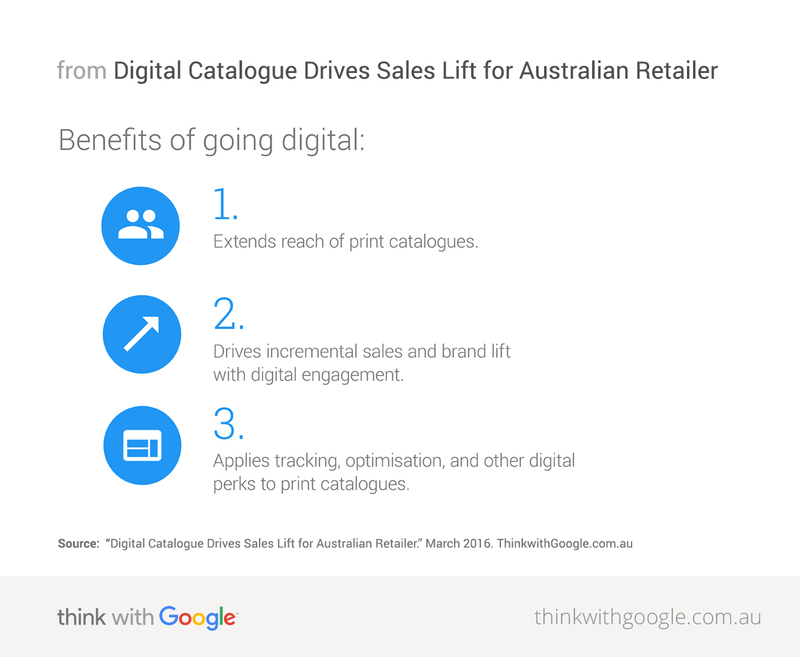 An Australian retailer extended the reach of its print catalogue by serving it across the Google Display Network. By running both print and digital, the company was able to reach more Australians, driving a 21% lift in "front page" item sales amongst those that engaged with the digital catalogue. For generations, department stores, apparel companies, grocery stores, and other similar retailers' tried-and-true method for driving sales and traffic to their stores was the print catalogue. But today, when you consider the challenges of accessing letter boxes in high-rise apartments and rural areas, bad weather, and, of course, those famous "no junk mail" stickers, odds are stacked against catalogues making it into the hands of Australians. In fact, as many as 2.5 million homes in Australia don’t receive print catalogues1—and in homes that do, only 62% of people read them. 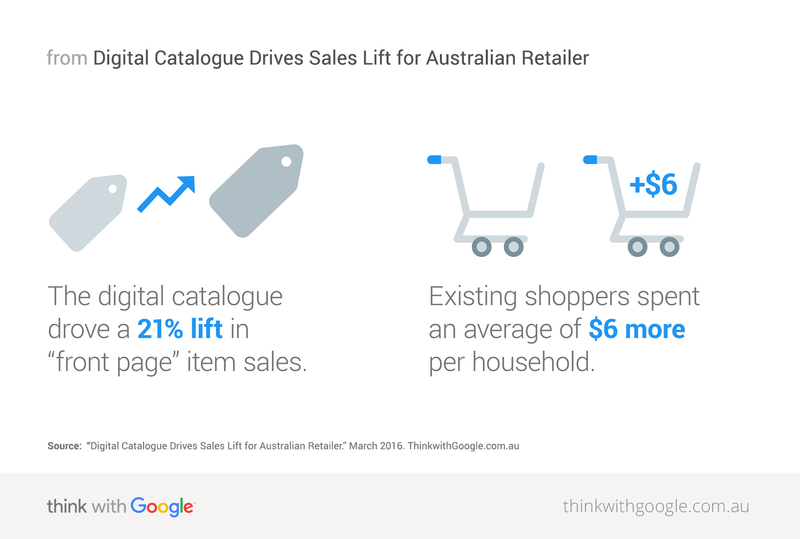 One of Australia's largest retailers noticed this trend and searched for ways to extend the reach of its print catalogues. Thankfully, as more Australians turn to the web, skilled marketers can combine digital and print efforts for great results. The retailer discovered the digital catalogue: A format that not only compliments, but supplements, its print counterpart. It offers brands extended reach proven to drive sales lift and engagement. The company could also get a bit more granular on which deals really drove traffic and interest. The retailer agreed to participate in an eight-week pilot program. Using a Lightbox display ad format and a third party catalogue feed, the pilot sought to extend the company's printed catalogue reach across the Google Display Network. As the pilot was running, Google worked with Nielsen to help determine the brand and sales impact of the campaign. By employing the Lightbox format, the retailer's digital catalogue encouraged engagement by inviting users to interact with the ads themselves, as you can see below. Users could hover their mouse pointers over an ad featuring crisp, digital photos of the retailer's most popular items to view expanded details. The expanded ad presented users the same catalogue and functionality featured on the company's website, and a click took them to the selected product. The digital catalogue allows users to see what deals are available and interact with the ads. Throughout the eight-week campaign, the retailer observed strong incremental sales, including a 21% lift in "front page" item sales among those who engaged with the digital catalogue.2 This was largely driven by existing shoppers spending more—to the tune of $6 more per household on average. Overall, the effort allowed for a greater, more cost-effective audience reach. Running the digital catalogue also had a positive impact on brand metrics among those who engaged with the ad,3 pushing the company ahead of comparable brands in terms of key brand attributes, resulting in a significant increase in favourability, consideration, and recommendation metrics. All this was thanks to an innovative combination of print and digital campaigns. Marketers take note, and you won't end up in the recycling bin. 1 Based on the 6.7M reach of a top print catalogue distributor (Salmat). 2 Nielsen Sales Effect, August-November 2015, n=290. 3 Nielsen Brand Effect, August-November 2015, n=1044. Methodology: Nielsen Sales Effect identifies households exposed to online ad campaigns and compares their offline purchasing behaviour with those who were not exposed to the campaign. Groups are matched based on demographics, geography, and past purchasing behaviour. Nielsen Brand Effect identifies individuals who are exposed to online ad campaigns and matches them to a non-exposed control group. A survey is sent to both groups and results are compared to identify the impact exposure to the advertising had on brand health metrics.